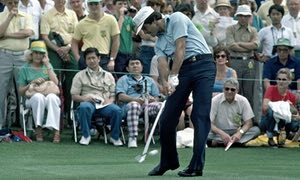 In 1980 Severiano Ballesteros won his first US Masters by 4 shots. At one point in the final round he was a mammoth 10 strokes clear of the field. If some people thought his win in the Open Championship the previous year was a fluke, this announced his arrival as a world star. "While winning the Masters that year, I was swinging so smoothly that I had high-speed sequence photographs taken of my action. I studied them and made pages and pages of notes for future reference. Indeed, I even went so far as to mark off ball positions, then measure the width of my stance and the distance I stood from the ball. Today, I wish I could forget all about that episode. Upon returning to Europe, my hot streak continued for a few weeks, then my game suddenly turned cold. This perplexed me because, according to some videotape I had taken of my swing, I was setting up exactly according to the notes made about my magic form at Augusta. "It just has to work," I told myself. But the more I clogged my mind with facts and figures, ultra-exact address positions and precise swing angles, the more my game went to bitter to downright sour. Finally, after a rest period at home in Santander, the truth hit me: "Seve, you fool, you're not allowing for changes in tempo, timing, mobility, head movement, hand speed, and , above all, your ever changing metabolism and mood." What does this have to do with trading? Well, we have to deal with the ever changing state and volatility of the markets. Because of this, we can actually suffer from periods where we outperform. There is a danger we go looking for something in that period which we try and use going forward, which was very specific to the market conditions at that time. This could lead to a lot of frustration. I have talked in the past about how I have made the mistake of making my own trade selection criteria overly restrictive, or in Seve's words "ultra-exact". Like Seve, I found that being too regimented in my approach affected my performance. These days, my criteria are simpler (I have reverted back towards what I used when I was at my most profitable) - this allows for more freedom or flexibility in changes of market state or volatility, but I am still working within a clearly defined framework and set of rules.